We had such a good Easter with our sweet littles! On Saturday night we decorated eggs with a new method we learned from a friend - just use crayons on hot, straight from the pot, hard-boiled eggs. It seriously was so much fun (even I loved it!) and it was not messy at all which was definitely the best part :) The boys loved coloring the eggs and I love how fast it was and there is no waiting! 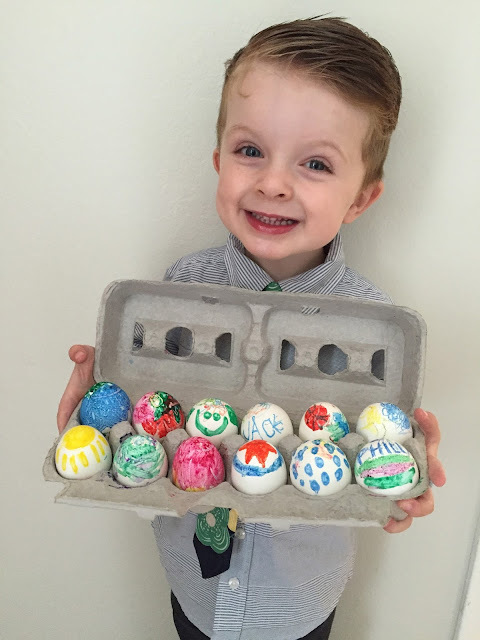 We've never colored eggs before because I've been so terrified of how messy dye would be with toddlers (and how well they'd even handle having to wait 3 minutes each dip ha) but doing it this way was a huge success and we'll definitely be doing it for lots of years to come! Until they learn their friends use dye and then maybe I'll be forced to switch haha! On Sunday we went to church and I taught the nursery lesson which was the sweetest ever. It's so much fun seeing the little tiny ones getting so excited to see pictures of Jesus and learning about His resurrection. They loved rolling the stone from the tomb with the little cutouts I had and we made them repeat the word "resurrection" like 15 times haha. I'm sad that you can't totally see the boys' matching ties with Zoe's hair bow but just trust me that her bow matches and it was so cute! Probably one of my favorite things to do is making them matching ties & hair bows! The fabric I ordered this year was so perfect, I'm obsessed with it! We were able to snag Daddy from meetings for just a minute to take a quick family picture! And we couldn't miss the opportunity for an Easter picture with Grandma Wallace! Too bad I got zero pictures of it but I hosted my first ever Easter (or first ever holiday for that matter haha! ), cooked my very first ham (turned out great, thank goodness!) and had so much fun. I actually love hosting and my mom is probably so glad that I do and is probably hoping I will host every year from here on out haha! Next time I'll just make sure to keep the funeral potatoes in the oven a little longer so we aren't eating them cold...oops. And let's talk about how cute Zoe was on her first ever Easter! I think this is her last first big holiday, how has almost a year flown by so FAST? LOOK AT HER YOU GUYS. So many heart eyes, I'm dying!! I am so grateful for the resurrection of our Savior, Jesus Christ. I'm so grateful that He Lives and He made it possible for us to live again too and be with our families forever. By far the biggest blessing in my life is knowing I get to have these little ones and my sweetest husband as mine forever. I hope you had the happiest Easter too!